L’exposition Crosnier extra muros était accompagnée d’une publication collective, composée de neuf cahiers individuels, dont l’un présentant cet entretien. Elke Giffeler: Baptiste, in your sculptures one immediately notices the choice of material. Things seem to be juxtaposed following an unknown order, as if they have to be this way. Is this spontaneous impression correct and, if so, wanted? 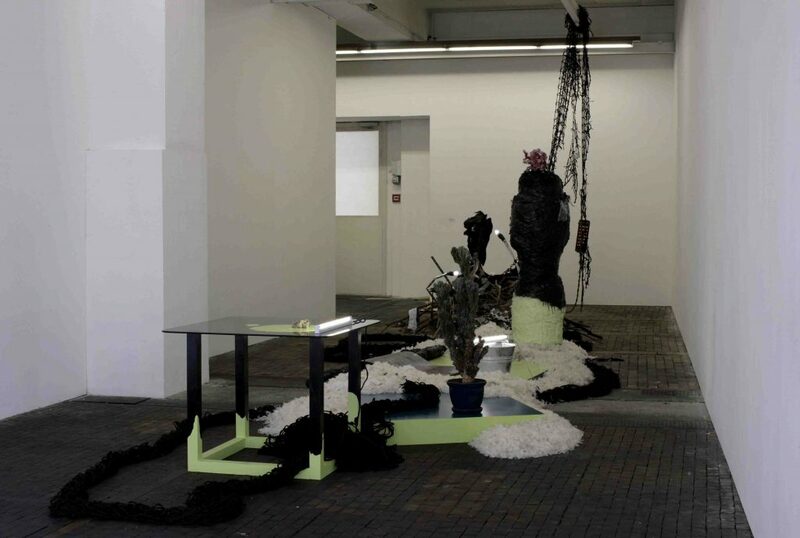 Baptiste Gaillard: It seems to me that one should be guided by materials. Wires, or ropes for example, often have knots. They might not have any if they’re short, but if you have long enough pieces they tend to twist and knot up and fall down in a certain disarray, as if they were following a hidden natural rule. I think that experiencing materials and following their possibilities gives us a tool that can be used to express something else one has in mind. Materials can become tools that have metaphorical capacities. On the other hand, it is not obvious to know what their nature is: a wire has not necessarily been invented to be twisted and knotted. The way I view material in general is informed by my own personal wishes and thoughts. Three words could summarize my vision of the materials I use: reluctant, unkind and lazy. For example, I like to imagine straw as being stained. Is it because I grew up in the country, and I remember fields during the fall, the straw leftover in the earth? It’s all a mix of references that inform my use of materials. The juxtapositions of material that appear in the work follow a certain unknown order, neither an Order with a capital O, nor a disorder. Some juxtapositions, due to the formal contrast between them, are evident, whereas others are more obscure. As concerns the global mapping of my sculptures, I always draw more or less precise sketches which take the exhibition space into consideration. These drawings aid me in trying to find the easiest way to elaborate the work and assure that it has density and power. E.G. : Talking about your background: you grew up in the countryside; would you say that your use of straw, leaves or feathers in contrast to wire, plastic bags, and tape mirrors a non-romantic awareness of nature? Do you aim to bring them (different materials) together as a whole or would you rather show /criticize an originally existing unity that is falling apart? If you compared your work to the work of an architect – how would you describe it? B.G. : The architecture, or the organization of the piece, is connected to the surrounding space. The way I experience and react to the space is important, but I also try to keep in mind how the spectator will experience the artwork, moving around it and finding details. An architectural way of planning the pieces enables me to create different zones of focus. My work is often produced for specific sites and takes into consideration their spatial characteristics, but can also be shown in other places. It’s like a kind of fluid sculpture which can be transformed and adapted depending on the space. I sometimes have the impression that all my work is a sort of parliament, in which different objects have different voices. I imagine a piece of old wood lying down and telling his soliloquy, a dusty shelf telling his soliloquy, etc. Even soliloquy is a structured form when it’s meant to be heard. Early on, I worked using different levels, like in a shelf. I had in mind burial grounds and cemeteries and the different levels between what is buried and what is visible. Of course, it was also a good way of managing the space. Working with different levels, on various horizontal scales, is a way of avoiding the sculptural ideal of erect verticality. Rather, objects appear to me to follow an “ideal of dereliction”. They want to be mistreated. Cady Noland said that she likes to hang materials on a butcher’s hook, like in a horror movie. Upon reflection, I realize now how romantic the theme of the cemetery is. But in my opinion, the romantic unity between Nature and Being does not exist. Nature is cold, and unlimited. I heard that Darwin had gone to the South American forest with other researchers, and where they saw abundance and fertility, he saw death. I don’t believe in a pure inner world, but rather in a compact world made up of external influences. E.G. : What do you mean by “inner world”? In another conversation, you compared your sculptures to a house with many terraces and different levels. This is how I arrived at the question about architecture. I prefer this image and find it is a quite telling and adequate image for your installations. The image of a house – even with many terraces and levels – carries in itself formal coherence. Still, the visual result that you present is a challenge to the viewer, in the sense of pretended chaos and absence of allure. Are you interested in the idea of anti-art? B.G. : I just meant that I don’t believe in a coherent, closed and self-sufficient personal world which serves as the basis of the artist’s reflection. This doesn’t mean that I don’t pay attention to personal content, biographical elements or specific atmospheres which leave an impression on me. The image of the house pleases me, and it can serve as a good metaphor for my work. I grew up in a big old ramshackle house. The use of different levels in my work isn’t necessarily meant to evoke this house, but I realize now that the two things are related. I associate different worlds with this house: the cellar, the forest, the gravel pit, the studio where our neighbor made sets for theater pieces, his flat on the first floor, the garden, the attic, etc. An old farm like this is also full of its own history, which is independent of my own memories. One has to be aware of this aspect… This house and its surroundings were suitable for fantasizing, and I know it has had a very important influence on me. Now, I am a bit ambivalent about the idea of anti-art, as it has become completely accepted by the art establishment. I am not interested in denouncing art. But I am no longer interested in art about art and the infatuation with art. Is that, perhaps, the beginning of a personal anti-art position? My interest lies in following paths which seem weird or are simply interesting to me, and I like to tell stories which, without being completely new, are also not exactly expected. E.G. : To me a main characteristic of art should be that it opens up new perspectives on life and raises questions on how to carry on. 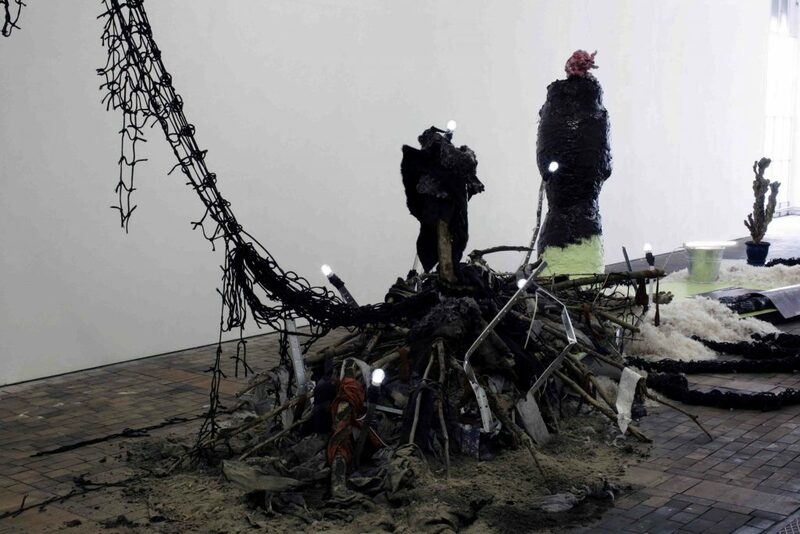 I understand your assemblages very much in the sense of how Edward Kienholz – who by the way grew up on a ranch – did not care about any kind of slick art form. He would respond to the absurdity and injustice of life not only by the choice of his subjects but also because they were so painfully realistic. In place of his assemblages (or let me call them three-dimensional images) your installations are more like abstract paintings. But you share a very painterly, thoughtful sense for composition and for use of colors, as well as a careful treatment of the surface which here means a common consciousness of the fragility of being. It appears to me that your work, by giving place to the smallest detail, for example a fly, is a struggle against the void (death). And through the careful organization of distasteful substances you make an acid comment on the common pursuit of beauty. B.G. : As an artist, I think it’s good to keep in mind the necessity of inventing one’s own language, which permits us to be aware of other people’s languages. Interaction is not just about taking the floor, but also about listening. To listen and to pay attention are political acts. When I was a kid, teachers told me I was “a dreamer”, and it was viewed as a little bit negative. But to me, “being on the moon” is an activity related to attention. Reflection enables one to mentally elaborate the details of everyday life. This morning, I found a pigeon waiting on my doorstep. He kept his head down on his body, and it was as if he was waiting for his death. I didn’t pick him up and put him in an assemblage, but it’s a good example of a feeling one can get when faced with certain scenes, a feeling between sadness, cold observation and luminous interest for stories and things. Small details can be an entryway to much larger, hidden realms. Art is like a tool, or a wealth of useful memory. My work helps me apprehend things in the world and bring them to light. This might be something that led me to make what I call “expanded paintings”, for which I take into consideration all kinds of materials that are now part of my vocabulary. I like this form of general justice that gives visibility to what is fragile, but my work, in its assemblage, can also be quite brutal and the small things within it are not always handled with kid gloves. Ultimately, an inherent chaos reigns. Elke Giffeler, born in 1972, has directed a private art collection in Berlin over ten years. She is a founding member of the project-space SOUTERRAIN and lives in Geneva as a freelance curator since 2010.